The Tecno Phantom Z with its specs and being a low budget smart phone are some of the reasons why Chinese phones have become dominant in Nigeria and Kenya. Having great specs/features that can be found on other smartphones like the HTC, Samsung, as launched by competitors in the market, the Tecno Phantom Z also known as Tecno A7 is suitable for users who want a smartphone that has features similar to those in high end devices and at the most affordable price. Below, you'll find the Tecno Phantom Z specs and price in Nigeria. Though the tecno phantom A and A+ are good and quite popular, the phantom Z is even better. It incorporates the features found on the previous models with additional features. For one, the battery capacity is higher, so is the internal storage memory. According to the Chinese company, users are to expect high performance and low power consumption from this device. The Tecno Phantom Z features a full 5.2 inch HD display with a 1920*1080 pixels resolution, providing clear and bright colour images and Videos. The Phantom Z's body is 7.89mm thin, 144.50 mm high, 71.90 mm wide, 8.1% thinner than an average smartphone in the 5.1 - 5.5 inch screen range which makes it easier to hold or slide into your pocket. The body is made from plastic and the sides are metallic. The Tecno Phantom Z is powered by a 2.0GHz Octa-core(8) Cortex-A7 processor to enhance it's speed, performance and support multitasking. 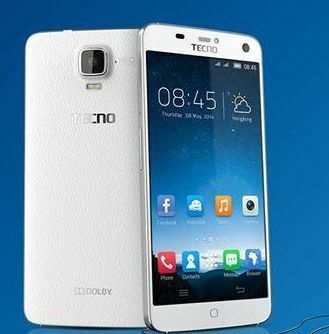 It is the first tecno smartphone to run on Android 4.4 (KitKat) OS. Its RAM size of 2GB and internal memory storage of 32GB is capable of supporting a higher number of multimedia, android apps and games irrespective of their sizes. Tecno Phantom Z features a 16 MP rear camera with dual flash. Its Front-facing camera is 8MP and when you compare this to the megapixels of other high end devices which are usually 2MP, you'll agree that with this device, one can take clear selfies and record videos with great quality. The rear camera as with the front-facing camera include features like autofocus, LED flash, HD video recording, Geo-tagging, Panorama and have been optimized for low light photography with BSI technology. The battery capacity of the Tecno Phantom Z is 3030mAh, provides up to 24 hours talk time and up to 300 hours of standby time. Other than the battery to power up this device, users are provided with a power bank whose capacity is 5200mAh. This acts a standby power source to support the battery when it goes down or drains, allowing you to worry less about your battery's percentage. Just like the Infiniix Zero and HTC one, the back cover on the Phatom Z is sealed and as such, the battery is non removable. This provides a battery which has a long lifetime, makes the body of the device slick and solid and, provides lesser gaps from which dust and humid can get into the internal parts of the device. Currently in Nigeria, the Phantom Z is available. At the time of this post, the Tecno Phantom Z Price in Nigeria ranges from N58,300 to N60,000 .